I'm trying to do what I think should be basic movie editing. I imported 30 minute movie from Camcorder DVD. I want to cut out deadspace, add chapters and text. Sounds simple??????? If I try to split more than 1 minute I get VideoWave9 error and the program closes. I did succeed once, but then I could not play the next section (PLay option no longer available in preview screen, Storyboard scene or Timeline.) I've contaced support twice, and sent one patch, and then instructions to "clean" and reinstall. Still having the same errors. I cannot install the 9.1 patch because I get errors that the correct software does not exist... I just want to have some relatively clean looking home movies. I have a HP7760. Vista OS and EMC9. You have an OEM version of the software that came with your computer. To work with Vista, and get the all of the features of the suite, you need to get the full version of EMC 9 or EMC 10. Thank you for your reply. I do wish that it was that simple. We do have a separately store bought version. We have MyDVD version 9.1.1.23. 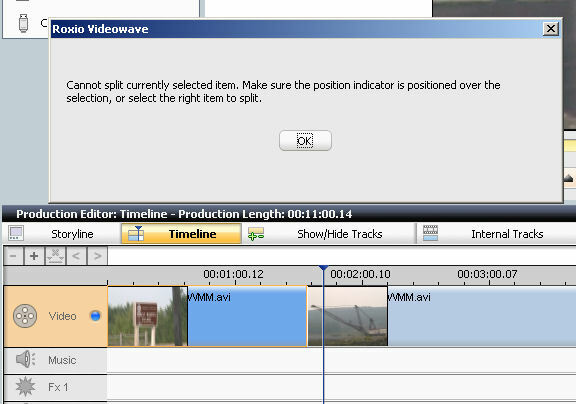 It is when we use this feature and try to split video that we experience the "videowave 9" error. Is it just me, or is the "Easy" in Easy MEdia creator a bit of a laugh? Any help would be great, I just want to move my home movies off of 30 min DVD's to a larger one with some supposedly "Simple" edits. The error you are getting "Cannot Split Selected Item" stems from user error. You have the scrubber on a section of the clip that is not selected. In the picture below, the scrubber is to the right of a split. However it is the clip to the left of the split that is selected or has focus. Note the yellow border around it, hence the error message! Now when I select the clip under the scrubber, I can Split all I want! Don't get too frustrated with this. Non Linear Video Editing is a very complex process and nothing is ever going to change that! EMC is indeed Easy compared to many other packages out there! Some allow you to 'select' by click & drag. That is about as precise as pen striping your car using finger painting! Spend some time going through the Tips & Tricks, here, as most of this is documented. I have checked to be sure that the line (Scrubber?) is on the correct panel of what I am trying to split, but still have that same error. For the time I've given up here and am trying to work the same process through the chapters (Thank you for the search through tips)...... Not sure I like it, but made some progress until my "VideoWave9" errors returned. I really liked Windows Movie Maker when I used to work with MPGs, but it does not accept VOB so it seems I'm stuck with Roxio. To be fair it could be Vista or my computer (but this is a new, fairly powerful computer), but errors and getting kicked out are not what I had in mind. You will have to take this up with HP… V9 has been out of production for almost 6 months and Roxio never did support OEM versions. Actually you have used the OEM enough to see about what it can do. Maybe it is time to decide on adding the Vista Certified V10 full Retail version??? I concluded years ago that OEM bundles were not worth my time. I can't tell you how many OEM CD's went from box to trash without ever having the seal broken! If it is of use to me, it worth buying the full Retail version! THis is a bought and paid for version of EMC9. (Right on the CD it says certified for Windows Vista as well) WIth the troubles I'm having with this one, I'm not going to pay another $70 bucks to try 10, and hope that it works. I did find that going through ViedoWave vs My DVD fixes the splitting issues, but I can still only work about 30 minutes before VideoWave 9 errors crash the program.I'm fighting my way through this (and also taking up the fight with both HP and Microsoft to try and find resolutions). Whoever can solve the issues first, wins. I was just hoping perhaps others have come accross such hang-ups and had some solutions. And I agree with you 110% about buying a new version when this one should work! We have far too many people who run HP's and Vista and V9.1 without any trouble to lay the blame on anyone of those suspects! I will tell you what I would do if it were my system. Video takes up a lot of HD space, so I would shop around and buy a new 200gb to 500gb HD and replace your existing HD. Then I would format that new HD and install Vista then EMC 9.1. My bet it is it will run as advertised! Then you have to decide if you want to reformat your original drive (after installing it as a slave and getting off your data) or retain the new one as your primary. I currently have 500GB hard drive with 2038 RAM.THere is still 280 GB free space.... are you thinking I need additional external hard-drive as well? I've purposely kept only a few videos at a time on the computer to work with so that I don't waste space with extra files that I don't need yet.